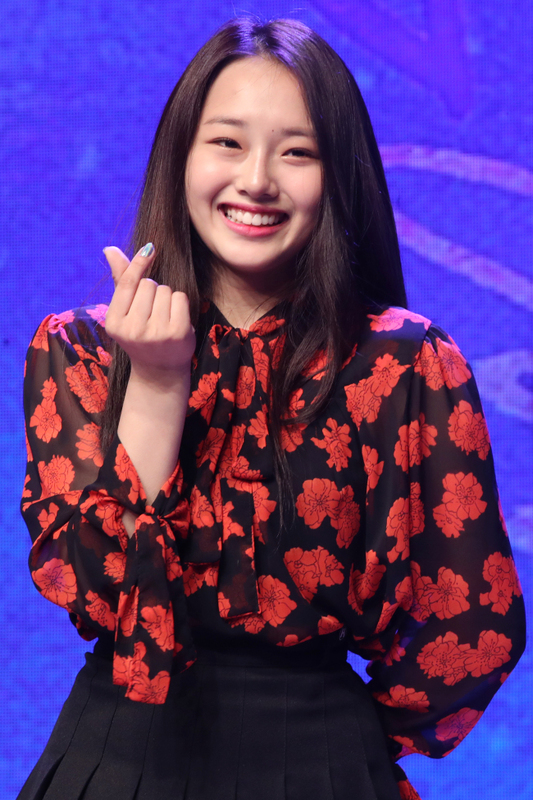 After nearly two years preparation in Korea, 18-year-old Filipino-American teen Kriesha Chu took to the stage for a sweet but energetic debut. Chu, once a runner-up on audition program “K-Pop Star 6,” delved into the experience of falling in love for her two-track debut album “Trouble,” released Wednesday. The lead track also titled “Trouble” and “I Wish It Were You” from the album both portrait a girl in love, while they differ starkly in musical styles. “I am so nervous, but extremely happy at the same time for finally making a debut,” said Chu at the Wednesday press showcase for her debut album in Seoul. Imbued with infectious brass backing and funky beats, the lead track “Trouble” is an upbeat pop anthem showcasing the songstress’ powerful voice. Veering away from the prior pep, “I Wish It Were You” is a more ambient pop-R&B jam featuring Chu’s mellow and youthful voice. It is also joined by rapper Yong Jun-hyung of Highlight, who has also contributed to the lead track as a producer. Her Korean was still imperfect, sometimes getting trapped in a jumble of incomplete words, but Chu went on sharing episodes on the album, keeping a bright smile on her face. After the smooth collaboration, Yong stood next to Chu and said working on Chu’s first album had been a great joy for him as well. “Despite her not-so-big figure, Chu exudes an enormous amount of energy,” Yong said. Chu, looking shy and flattered, said that Yong’s group Highlight has been one of her favorite artists back in the US and that working with him was a great honor. Yong also offered words of wisdom and advice to the younger musician when working together, said Chu. As one of the finalists of “K-Pop Star 6,” Chu said that someday she wishes to collaborate with her group KWINS, which included other contestants Kim Hye-rin and Kim So-hee, who has also dropped a debut single last week. “I saw my friend So-hee making a debut. I don’t think we will be rivals because she has always been so talented. We support each other and I hope both of us could be equally loved,” Chu said. Hailed from Cebu, Chu was scouted by Urban Works Entertainment while she was in San Francisco. She flew to Korea with her family in 2015 and has been staying as a trainee before she competed in the audition program from November last year.